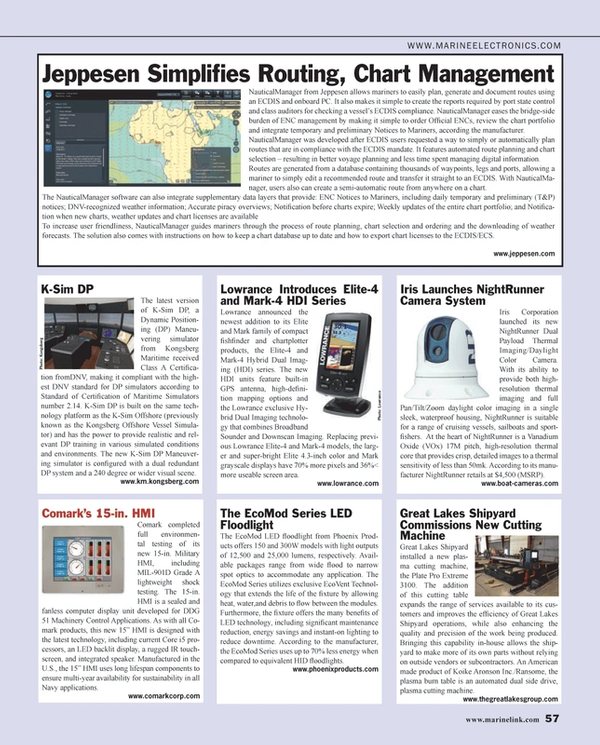 NauticalManager from Jeppesen allows mariners to easily plan, generate and document routes using an ECDIS and onboard PC. It also makes it simple to create the reports required by port state control and class auditors for checking a vessel’s ECDIS compliance. NauticalManager eases the bridge-side burden of ENC management by making it simple to order Official ENCs, review the chart portfolio and integrate temporary and preliminary Notices to Mariners, according the manufacturer. NauticalManager was developed after ECDIS users requested a way to simply or automatically plan routes that are in compliance with the ECDIS mandate. It features automated route planning and chart selection – resulting in better voyage planning and less time spent managing digital information. Routes are generated from a database containing thousands of waypoints, legs and ports, allowing a mariner to simply edit a recommended route and transfer it straight to an ECDIS. With NauticalManager, users also can create a semi-automatic route from anywhere on a chart. To increase user friendliness, NauticalManager guides mariners through the process of route planning, chart selection and ordering and the downloading of weather forecasts. The solution also comes with instructions on how to keep a chart database up to date and how to export chart licenses to the ECDIS/ECS.